Item usually ships within three business days. 3 function hitch system provides more pulling options than any other on the market. Great for farm/ranch, hunting, fishing, utility and more. Unique 3 function design allows you to have a hitch ball, clevis pin mount and tow hook always ready to go all in one unit. Just rotate the drawbar for the function you need. Save time and space with this all-in-one unit by not adding and remove hitch balls or lugging extra attachments around. 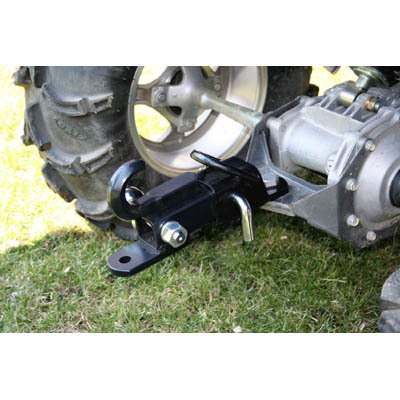 Receiver attaches to all ATV’s and Lawn Tractor’s with factory hitches that accept a trailer ball. Receiver accepts 2” square drawbars. Rugged powder coated steel. 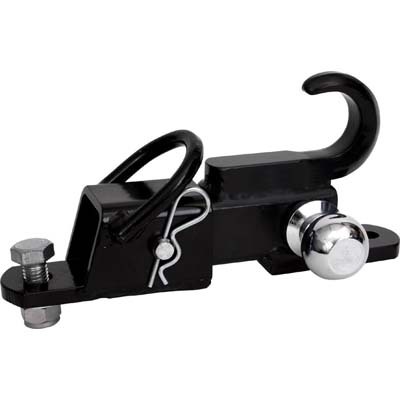 Includes bolt on receiver, 3 way drawbar, 1 7/8” hitch ball, pin, clip and mounting hardware. Requires hitch ball with ¾” diameter x 3” long shank (1 7/8” OR 2" hitch ball available).